It’s time to officially announce the biggest, most sensible event of 2016, Sensible Days! 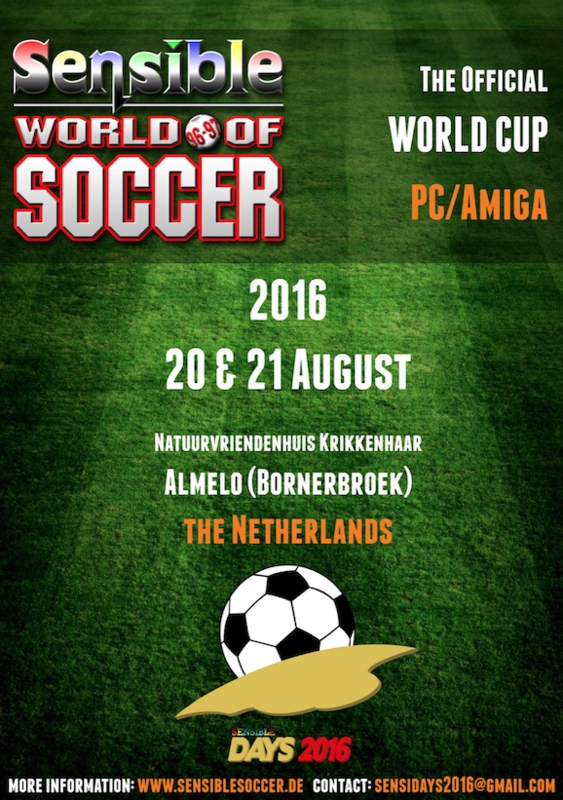 This year the 13th annual Sensible Soccer World Championships will take place in Bornerbroek (Almelo) in the Netherlands. After all these years it’s amazing that the game is still going strong, and the community ever stronger. instead of only ooo, hf, gl, adf and so on and so on. magnificent matches like Lobo vs Bomb (penalty shoot out), the amazing DjowGer vs Playaveli PC Final and Ali’s march to the Amiga title. and hopefully a few surprises (oranges and apples anyone?) . As stated, the tournament will revisit Natuurvriendenhuis Krikkenhaar in Bornerbroek (close to Almelo) in the Netherlands. The house lies in a quiet forest and we have the whole house for ourselves. Fifty (50) people can sleep over. There are 18 bedrooms of various sizes on two floors. an outdoor terrace, wifi (though the amount of connections is limited) and so on and so on. More information and a few photos (sorry, Dutch only) can be found at http://nivon.nl/natuurvriendenhuis-krikkenhaar-bornerbroek . It is difficult to reach the location via public transport. The nearest commercial airports are Schiphol (160 km) and Eindhoven (170 km). but a much better solution is to let us pick you up from the station. All questions and requests concerning travel can be posted in our transportation topic in the forum. As always there are a few other things you have to know beforehand. - You have to bring your own bed linnen etc. and towels If not, you can rent a set of bed sheets for € 7,50 and towels for € 1,-. Let us know in advance. This will have to be paid on arrival. - We are allowed to be as noisy as we want until about 11 in the evening. into the early hours of the morning...inside that is! so you can smoke on the terrace (that’s where the ashtrays are). (hopefully a bit later, but we can only arrange that close to Sensi Days). and that the bedrooms are “clean”. In total 8 meals will be served. We ensure there will be all the drink (cola, diet cola, orangeade, lemonade, and some kind of alcoholic beverage) you want. We will also ensure that you can eat all the (toasted) sandwiches and crisps you want. All included in the fee. It is also possible to order fast food (pizza’s etc.) for some extra euro’s. We’ll have a list of options for you during the tournament. If you have other wishes concerning your diet (e.g. vegetarian) then please inform us beforehand. Concerning the rooms. There are four rooms for one person, five for two people and nine for four people. The pre-payments etc mean that only rooms for four are bookable. One person rooms only in special cases please. Please state your preference when booking and who you are going to share with. This is based on the principle “first come (= paid), first served”. We have no different rates for the different kinds of room. The following Sensi Package Holidays can be booked. Consult us for our non-package holiday deals! So if you don’t want unlimited drinks etc.. Remember... paying = playing so all bookings will be confirmed as soon as the payment has been received. Please send a mail to sensidays2016@gmail.com for the exact details. For questions and more information concerning paying, please contact Romanista at the same email address. 10.00 Tournament Draw for Amiga + Group Photo! The following rules are the same for both (AMIGA) & (PC). Only difference is the tactics and KO rules. Players are placed in groups by drawing from pots. The pots will be created beforehand by a well-respected group of Sensi veterans. The pots will be posted in the forum about one week before the tournament starts. to add a personal touch to your team (names and colors). For base we will use the online save disk. A custom teams and tactics thread will be created later on. Always random (pressing ESC to get a new pitch, only if both players agree). If both players agree to play on a specific pitch this is fine too. Free of choice. Feel free to bring your own controller. Also there will be various controllers present at the tournament. The "home" player may pick his seat position first if he wants to. Players are not allowed to press "R", "S", "SPACE", "F9" & "ESC" during a game unless agreed upon amongst the two players. Number of substitutes for each match is 5 of 5. Amiga KO-rounds: 2 x 3 min, no ET, no penalties! - If it's a draw another 2 games have to be played! - If they also end in a draw (no extratime!!!) on agg. a penalty shootout will take place! The home player (the first player of a fixture "Home vs. Guest") is allowed to use a custom tactic. If he does that the guest player is also allowed to load a custom tactic! If the home player doesn't use a custom tactic, the guest is not allowed to use a custom tactic. if he hasn't got his own (except the one from opponent if he does not agree, unless he is not the creator of it)! However, only 1 tactic may be loaded per player! PC KO-rounds: 2 legs, ET if replay, penalties if replay! - On PC custom tactics are allowed in every match without any restrictions! However, only 1 tactic may be loaded per player! Looking forward for more info. Fincad probably we drive with 2 cars so there is enough space. Which date what time you arrive? If I'm coming will arrive on Friday about 10 am or so to the schipol airport. gas expenses and so on. We have to check it out later this year cause not sure yet if I'm participating world cup or not. If I didn't mention it already - I'm in. Amiga tournament on Saturday then? Or Sunday? But there has been no further discussion on this, yet! I could pick up someone at Düsseldorf airport on Friday, if needed! I hope I will be able to join, but dont look good atm.. Fingers crossed, will know within a month..
Is it possible that anyone can help me make a custom Amiga keyboard or potentially buy one that someone does not need anymore? This way I can practice and avoid the embarrassment of turning up without a keyboard (again). I have a MegaDrive controller adaptor and I plan to use this to play on the emulated version and then use it for tournament in the summer. This would work yes? @Klaris: really hope you can work something out, Sensi Days isn't the same without you! @Mdogg/All: I don't know about the adapter, but in our meeting Saturday we discussed ways of speeding the tournaments up. One point was the amount of keypads. I for example don't have one, and I'm a mathematician, not an electrician. but also a few extra as ss.de backup for next Sensi Days? @All: I hope to have the introduction post with location info, prices etc this weekend (sorry, very busy week at work).